Saab Owners' Convention 2019 - July 25-28 in Loveland, Colorado 1 Members Like This Post! 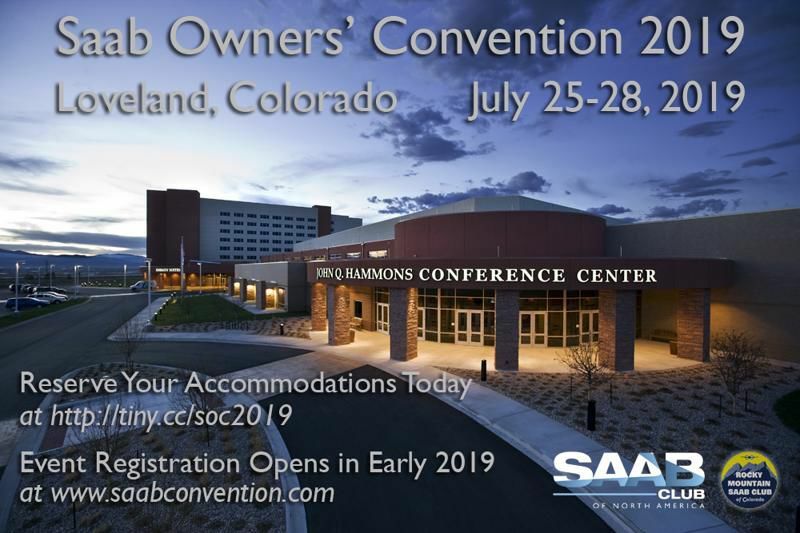 The Saab Club of North America and the Rocky Mountain Saab Club are pleased to announce that the 2019 Saab Owners' Convention will be held in Loveland, Colorado! The dates are Thursday, July 25th through Sunday, July 28th. The room block is available to reserve your rooms today via the below link. Information on full event registration and more details will be posted on Saabnet in early 2019. Save the date, and hope to see you next summer in Loveland! ->Posting last edited on Wed, 17 Oct 2018 19:51:29.